For millennia, men have been happily and the most negligently creating the alpha men world at the expense of women, resulting into imbalanced power equation and the women bore the brunt. The situation has turned so bad that she has come to be known as ‘disadvantaged class’! But, thankfully girls today are fearlessly and ruthlessly disrupting the men’s world; ‘intruding’ into the world and making them respect for what she is. And defence and police which have always been a male domain are no exception to her confident steps. Meet Mrs. Anita Punj IPS (Presently Inspector General of Police, Personnel & Training, Punjab), a real life iron lady of Chandigarh! For all those people, who think ‘IPS is not suitable for woman… IRS or any other service is more suitable’ or even ‘Civil Services is not the career for women. It destroys family life’, Anita Ma’am has a fitting answer to them all in her deeds. 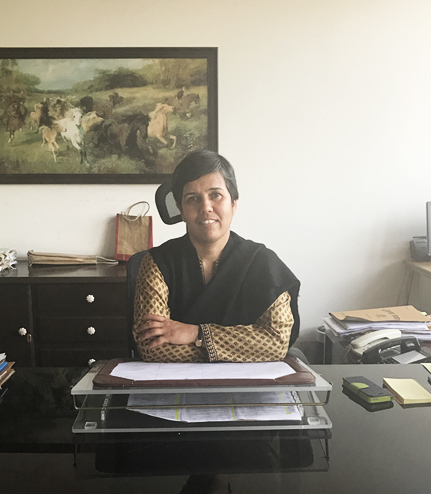 She is married, has a daughter and still she has been SP Vigilance at Ferozepur, Deputy Director at the Punjab Police Academy and SSP of Moga and Hoshiarpur districts of Punjab, a UN peacekeeper at the United Nations Mission in Kosovo, a faculty member at the National Police Academy at Hyderabad where she trained five batches of IPS officers, a British Chevening scholar and has led a pan-Punjab programme on Child Rights and Child Protection in association with Punjab State Human Rights Commission and British Council. She has also been an accredited trainer for Springboard Programme conducted by the Bureau of Police Research & Development in collaboration with the British Council for women in police in India. Anita Ma’am is still hopeful of the gradual change in the power equation in the home. With more and more women from big cities atleast joining the workforce, the responsibilities at home will definitely be shared. “As a law student back then, I could never understand the co-existence of Right to Equality in Indian Constitution and only sons getting right over ancestral property according to Hindu customary law. But, it took time, things changed. Similarly I feel if not in short term, in not so distant future, things will change, I’m sure.” The more visible women are, the faster will be this change. She has beautiful message for the youth. Meeting her I realised strong, powerful women are not born overnight. We need to nurture her, give her space and respect to have a head and heart to speak and have confidence in her when she chooses to take a road less traveled. As Anita ma’am herself shared her stories of childhood. Her parents ensured ‘internal democracy’ within the home and everyone had the freedom to speech and expression and choose where his/her happiness lies. ChandigarhX is honoured to have her as the Face of ChandigarhX International Women’s Day Celebrations. More power to her! We, women are blessed to have a role model like her. Chandigarh, Gear up For Hotter Days Ahead!